An important objective is to reduce how cleaning impacts the environment. Though a more critical target with green cleaning should be to protect health. 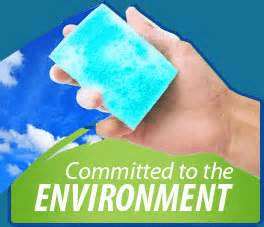 Research and advances in technology, have produced several environmentally preferable cleaning products that can adequately deliver both of these goals. Green Cleaning in healthcare sometimes leads managers to mistakenly believe green cleaning is all about chemicals. However it’s important to also realize that equipment used with cleaning is similarly important in attaining the green clean goal. Specifically, any facility looking to obtain the LEED (Leadership in Energy and Environmental Design) certiﬁcation, must use the right cleaning equipment to be able to earn the certiﬁcation. Cleaning equipment used in Environmental Services has seen signiﬁcant advancements in the green cleaning process which allows managers to implement their use throughout facilities. These changes involve ﬂoor machines, vacuums and extractors. * A quiet motor: LEED standards require that ﬂoor machines, along with other cleaning equipment, meet speciﬁc low-decibel settings. * Low moisture: A low-moisture automatic scrubber has an advanced squeegee and vacuum system so chemicals, solution and contaminants are thoroughly and quickly recovered. It also has variable-speed pumps for more effective low-moisture cleaning. This allows ﬂoors to dry quickly, minimizing slips, trips and falls. * Less chemicals and water: Green automatic scrubbers use less chemicals and water than conventional machines. * Indoor air quality protection: The machine has its own vacuum system to trap and hold dust, dirt and contaminants as the machine is being used. Typically, the machine will also have a shroud covering its base to minimize the amount of dust and debris escaping from the machine. * Maintenance-free gel batteries: Conventional batteries can be dangerous to work with. Maintenance-free gel batteries require no maintenance and are overall much more environmentally responsible. * Cylindrical brush technology: Some manufacturers produce ﬂoor machines that use brushes instead of pads. The potential beneﬁt of the brush system is that it can dig deeper into porous ﬂoors and grout than a rotary machine, which may mean less water and chemical is necessary, reducing the machine’s impact on the environment. A green vacuum cleaner needs to have a high ﬁltration system that traps and holds dust and debris so that it is not released with the machine’s exhaust. The machine should also be designed so that negligible or zero air is allowed to pass through the vacuum’s shell. Carpet extractor equipment companies have made signiﬁcant progress in producing highly effective, low moisture carpet machines. Years ago when the carpets were cleaned, it could take several hours, if not days, for the carpets to dry due to inability of the equipment to remove the amount of moisture left of the surface. Newer low-moisture extractors typically use less than one gallon of water per minute and allow carpets to dry in less than 24 hours. This not only uses less water, but also ensures that mold and mildew don’t develop causing additional problems. What Types of Cleaning Products Can Be Used and Where? * Critical and high risk: Areas such as emergency rooms and surgery areas fall into this category. These areas must use speciﬁc disinfectants as required by CDC and regulatory agencies. Disinfectants in the United States cannot be marketed or labeled as “green.” For this reason, only EPA approved, hospital grade disinfectants can be used in these areas. * Semi-critical areas: Public clinics, rehabilitation areas, nurseries, restrooms, and so forth fall into this category. Disinfectants must be EPA approved hospital grade. However, ﬂoors are surface areas that typically do not require the use of disinfectants and can use a green cleaning product instead (follow CDC recommendations where blood and body fluid, or certain infection concerns may be present). In addition, ammonia free glass cleaner and non-acid toilet bowl cleaners are good examples of environmentally preferred products to use in these semi-critical areas. * Noncritical areas: The administrative and office sections of a hospital or healthcare facility can be categorized as noncritical cleaning locations. In these areas, environmentally preferable cleaning products can be used unless the hospital speciﬁcally requests the use of other cleaners and/or disinfectants. * An important development with green cleaning came about as independent, third party certiﬁcation organizations were established. These organizations have provided speciﬁc standards and criteria identifying what ingredients can and cannot be used in a green-cleaning product. They have done the work of identifying if it is green-certiﬁed and can display the label of a respected certiﬁcation organization. This allows the environmental services departments to have conﬁdence the products will have a reduced impact on the environment. Protecting patients, visitors and staff in hospitals is the key goal of Environmental Services. Following the recommendations outlined will allow that goal to be accomplished with no financial cost to the facility.